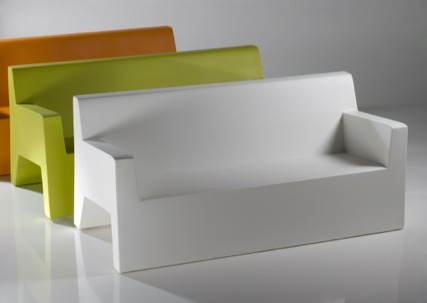 The Jut furniture collection from Vondom is the world's first album of contemporary furniture made out of polyethylene materials using the rotational molding process. This makes each piece perfect for both indoor and outdoor use as all units are imperious to UV damage, bad weather conditions, and splintering. Each unit is specially designed to withstand extreme atmospheric situations with zero color fade or material loss. Jut is designed with your comfort in mind. The angles are easy on your body and your mind. Each piece is easy to sit on and appealing the eye. No small detail has been over looked in the Jut line . Vondom even designs water drainage channels into every unit so that rain water simply washes away instead of pooling. .